Is today capable of successfully handling multiple events of various scales and different levels of social as well as political importance throughout Maharashtra at a time. The firm takes pride in its ability to efficiently provide various event management services such as stage decoration, lighting, sculpture arrangement and floral decoration for any given event, all at one place. Rushabh Mandap Decorators was conceived in 1991 by Mr. Rajiv Bhatt with a modest set of services. Owing to his sincere hard work and utter dedication, the firm flourished to become today’s largest provider in all region i.e. Gujarati, Marathi, Madwadi, Punjabi etc. The reason behind growth of Rushabh Mandap Decorators is the strong connection of its co-runners with ground level operators. The owners provide personal attention to the smallest details and make sure the events will run smoothly. The team that dedicatedly operates for the firm is committed and experienced, and includes smart and resourceful members. Owing to these traits, Rushabh Mandap Decorators functions with an attitude that makes it an answer-to-every-solution force capable of bringing smile on the face of the customer every single time. We also offer a large range of menus to suit every taste and budget(specially Gujarati,Punjabi,Maharastian,Madwadi etc.. 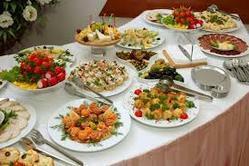 If however you need custom-made menu to suit your occasion, call on us with your requirements and we will compile it.